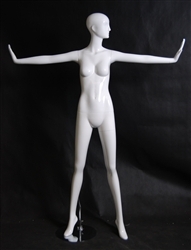 Add some fun to your displays with this trendy headless female mannequin is standing in a cute pose holding up peace signs on both hands with a glossy black finish. Made of fiberglass. Includes base.